Arai created the first original adventure helmet and over the years they’ve refined the design into their current XD4, a premium off-road and street use option that’s widely accepted as one of the best dual sport helmets available in regards to both safety and functionality. Built on a composite fiberglass shell that has an intermediate head shape, DOT and Snell ratings, and only 3.6 pounds of weight, the XD4 focuses on providing an excellent base to build features into. Features include the flip down visor with its integrated vent ports and the adjustable peak, both of which are entirely removable. And with a high quality shell maximizing safety, Arai is able to pack more comfort lining and padding in places that would otherwise be taken up by safety oriented materials. The XD4 has plenty of intake ports (with many of the ports on the chin bar being dedicated open/non-closing) and exhaust ports so air stays fresh when you’re working hard on the bike, and the dual chimney vents have a unique lever actuation that’s really convenient. With a large amount of safety, versatility, and comfort the Arai XD4 Motorcycle Helmet ends up being a nearly perfect 50/50 helmet for adventure riders that split their time equally between dirt and asphalt. High-flow peak channels air directly into the front vents. Twin-cam Shield Pivot System allows the face shield to operate fully under a peak that can be lowered for better aerodynamics. Fully removable/replaceable and washable liner. 4 top vents. Dual Intake/Dual Exhaust Ventilation - dual 1/C top intake vent and Double Delta bridged exhaust vents designed to draw significant volumes of air from helmet interior. CLC (Complex Laminate Construction) shell - fiberglass composite is stronger and lighter - allows use of softer, less-dense liner materials inside for increased rider comfort. Efficient chinbar vent (with interior and exterior controls) flows fresh air to the mouth area or across the shield interior to help prevent fogging. Large chinbar side exhaust vents draw out additional hot air. Very pleased fit, durability, and protection. I've had the misfortune of testing it out on a hard slide across rocks and didn't suffer any head injuries. It worked so well that I replaced it with another XD4, without considering anything else. A lot of wind noise - I wear ear plugs for highway speeds - I've worn Arai's for 20+ years so the fit for my noggin is typical, read: good. Actually, this is my first helmet. I had a hard time finding a helmet for my big head. This helmet was true to the sizing chart and fit the first time. phew! Only one complaint is the slight fogging issue. Right away you can see this is a first class helmet, fit and finish top notch. Visor works great as do the vents. This helmet is loaded with features! Had to trim foam on ear peices to prevent chaffing. Reasonably quiet but still wear ear plugs. I bought this helmet after deciding to start adv riding. 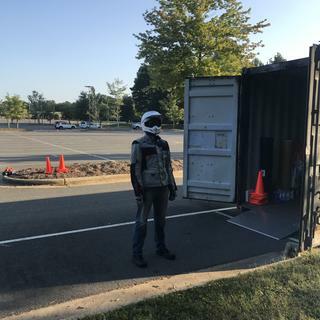 I took the MSF class and during the two range days, there were only a few spots where I took the helmet off. Having that said, each day was from 0800 to 1600. I had the helmet on almost 8 hours a day for two days. I didn't feel fatigued and the helmet didn't feel like I was wearing too much weight, and felt comfortable to have on that whole time. The fit is paramount because if it doesn't fit, it won't work when you need it. I would gladly buy this again. P.S I found this helmet because of a video that said it was the best helmet for people who wear glasses. I can attest, it is great for this and even if you don't, your safety glasses won't pinch your heads through the cushions or anything. Great product! That's me at the MSF course. Great helmet, I'd gladly buy it again. Great helmet! I had initial concerns about how much wind noise a helmet with a visor would generate, but those were quickly erased when I started riding with the XD-4. 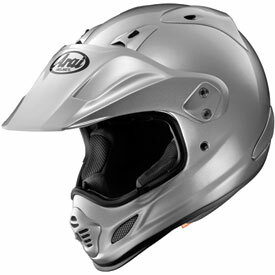 This helmet is quieter than my older Shoei RF-1100, and the fit is excellent. I love the high-viz yellow, especially here in OKC where drivers have zero SA on anything happening around them. I'm 5'11" on an F800GS with a windscreen, and I don't feel like the helmet catches any more wind than my prior "normal" street helmets. I feel like the lateral field of view is also much better than my old Shoei, which was a pleasant surprise. Best you can get! got a 10.00 head? wear a 10.00 helmet. If not BUY ARAI! Overrated. Not worth the money. I despise this helmet. I bought it with the intentions of getting the best adv helmet made and I've been disappointed the whole time I've owned it. -The cheek pads have no void in them to accommodate speakers or even my ears. My ears are always uncomfortable and on rides where I need to remove the helmet several times a day, the back of my ears will get rubbed raw from the cheek pads. -The visor is terrible. It is thin and has terrible lateral vibration in anything but the smoothest air. Any bike I've ridden with any decent windscreen makes the helmet vibrate so bad it blurs my vision. -The chin bar is too short. -The lining material is rough. I just don't see why this helmet is so expensive, my helmets that cost half as much seem just as good. My advice would be to try one before you buy--don't just assume that spending more money will get you the best helmet because this one definitely does not live up to the hype for me. I have had cheaper helmets in the past and didn't realize what I was missing until I tried the XD3. I realized the value when on multiple day rides - the comfort is awesome. Any helmet can feel comfy for a few hours, but days - not very many can remain comfortable. I wore the XD3 out and recently got the XD4 (newer version of XD3). Like the XD4, it is awesome. i like the visor on the XD4 better (less vibration at high speed). If you are serious about riding and you put a lot of miles on your bike, get this helmet! Quite possibly the best helmet ever for adventure riding. It's so comfortable you forget it's on. Lots of side view makes it a safe helmet when you're in traffic and have to maintain your forward vision. Plus Arai's safety features and reputation make it a no brainer. I used RMMC's sizing chart and was awarded a perfect fit. Helmet was in stock and I had it to my door in two days. 5 stars to RMMC and Arai. Really like this helmet. I had the XD3 and when it came time to replace had to get another Arai. The fit is so comfortable and it is light. I used the size chart and it was right on. The XD4 has better ventilation in my opinion. I feel very safe in the helmet. Yes, the price was a struggle to get by but it's your head. The only thing I could complain about is the plastic air ducts on the top. I have not done it but could see breaking these going under and hitting a tree branch. All in all money well spent. Arai is the best helmet brand in the market. It fits very well.Isolation and air flow make me feel comfortable. This is the perfect helmet for me, a little pricey but my head is worth the extra couple hundred dollars! The visor is nice to have but I mostly tuck it up and use goggles. will goggles work with this Helmet? BEST ANSWER: Yes. Smaller goggles will fit under the shield, larger goggles will not. In either case, I recommend removing the shield to use goggles. Although the smaller goggles will fit, they contact the inside of the shield and will mostly mar and/or scratch the shield. It has a built-in face shield but the shield could be removed and googles would probably fit the opening but it is not a typical MX helmet opening that would accept the larger style goggles. I haven’t used goggles with the helmet yet. However it seems it would be a perfect fit when the shield is taken off which is quite easy. Yes, goggles work with this helmet with visor in up position. Or visor can be removed and stored if goggles are desired eye protection. I have Scott hustles and they fit. I tried my buddies that didn’t fit. I think they were 100% brand. Yes but you must remove the visor. Parts are included to do so. Would I be able to install a Sena 10u communication system in this helmet? BEST ANSWER: Yes it will work. Is the price in Canadian dollars? BEST ANSWER: No, unfortunately all of the prices on our website are in USD.